Aikido doesnt work 100% in real fight or MMA competitions...anyone disagree? Best Answer: i tell you what then if you think that then why dont you convince the thousands of police academies all over the untied states not to teach aikido. you also might want to tell the fbi since they train aikido as well among many law enforcement agents. "many United States police academies choose Aikido as the martial art for their self defense training. Also, strong force, large size, and muscular strength are unnecessary for success. Smaller women can control much larger men in a barehanded situation." You do realize that there's nothing in Aikido that's not seen in other styles? What makes Aikido distinct from other styles is its philosophy - something very compatible with police forces around the world (except for those in totalitarian regimes where the police fear no one). Therefore, the only videos you're gonna see of anyone doing any martial arts is going to be someone doing something common to all martial arts. On the other hand, I agree with you: it doesn't work in real fights, mma competitions, or even in the dojo. It doesn't work any more than a recipe has taste or a house blueprint can stand up to a hurricane. What we are taught in martial arts - including Aikido - is techniques. Until they are taught to a human being, they are abstract. The human being has to make the techniques come to life. So technically... you're right: it won't hold up in fights, etc. Having said that, there are two reasons why it (or rather the practitioner's skill) won't work in MMA competitions. First, because it's the wrong tool for the job. Aikido works on a philosophy of avoidance. Imagine Silva walking out of a fight because he doesn't think that fighting's the answer! 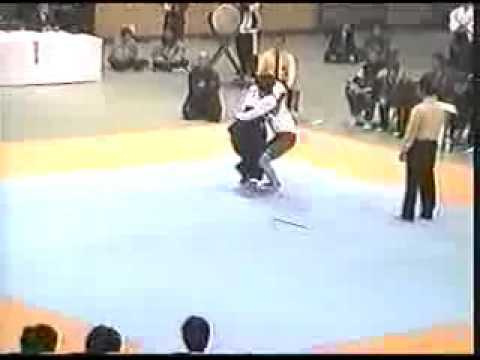 Second, Aikido is the wrong tool, because many of its techniques involve small-joint manipulation - a stated prohibited rule in MMA. Don't blame Aikido for this... Ask Dana White why he has this rule in place. As to real fights... you want to know why you don't see Aikido being used in real life? I mentioned before about its philosophy of avoidance. Apparently, the absence of the videos suggest... it's working. There, I think, is your proof. It's just so hard to find an actual aikido sparring against another style in a competition. For your information, the opponent is probably a shooto fighter which is a pre-MMA style in Japan. They had a no punch to the face rule so they threw palm strikes instead at the face. Also they should be both amateurs. Amateurs as in they are not earning their main income by fighting competitions. How do you fight with Aikido? The moment you fight someone with Aikido it's no longer Aikido it becomes Aikijutsu. Aikido isn't for harming, killing, or fighting. It's for self-defense without harming within your power and the betterment of yourself. If you want a fighting system with Aikido's techniques and more then you could look into something else like Daito-ryu. I've studied both, and I have over thirty eight years in martial arts. Been in real fights in the streets growing up in a tough neighborhood. In my personal opinion any art can be productive if one can apply the techniques in the modern world. Aikido is tough to employ in street combat, but not entirely impossible. Depending upon how the attacker attacks as well plays a vital role. It also depends upon what works best for you body and mindset. Even a dull knife can be sharpened like a razor. Any martial art can conquer, but the secret is in adapting to your opponent. Being able to telegraph his movements. No Martial Art is effective. Only people are effective. In a self defense situation, yes Aikido practitioners can be very effective. I don't have to prove anything to you. As for the video it is kinda difficult for someone to video tap it happening. Beside i do know a few law enforcement individuals who shared their experiences with me on if they work or not. They actually do work. Do to legalities it is hard to get a video of such working. But here why instead of posting a question and demanding a video why don't you go to a Aikido school and see for yourself if it is possible? You are also welcome to go to any Aikido dojo, interrupt the class taking place, loudly proclaim your disdain for Aikido and how you think it is worthless and fake and then take you best shot at the sensei. When you do such, please, have someone with you to video your experience so that they can post the same online and to take you to the local hospital. We will be awaiting your performance. Is aikido a really effective martial art good for MMA or real life street fight? AIKIDOKA: "Aikido in a real fight is 70% atemi and 30% technique" (O Sensei). What does that mean to you? Is Aikido practical in a real fight? Is Aikido Effective in real fight? Will we ever see Brock Lesnar perform a WWE pro wrestling move in a real MMA fight?